The icon of Hong Kong cinema and the man who brought martial arts to the masses, the dragon himself: Bruce Lee. The icon of Hong Kong cinema and the man who brought martial arts to the masses, the dragon himself: Bruce Lee. Lady Gaga is the queen of American pop music. Lady Gaga is the queen of American pop music. 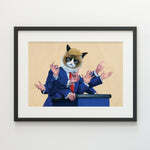 Donald Trump depicted as the corporate fat cat he is - gesturing beyond belief, dictating his love for some and disdain for others. Donald Trump depicted as the corporate fat cat he is - gesturing beyond belief, dictating his love for some and disdain for others. Born in Aberdeen, Washington, the prince of Seattle's Grunge sound: Kurt Cobain. Born in Aberdeen, Washington, the prince of Seattle's Grunge sound: Kurt Cobain. Don Cherry as his beloved bull terrier Blue with Ron MacLean by his side having a classic back and forth discussion about the hockey world. Don Cherry as his beloved bull terrier Blue with Ron MacLean by his side having a classic back and forth discussion about the hockey world.